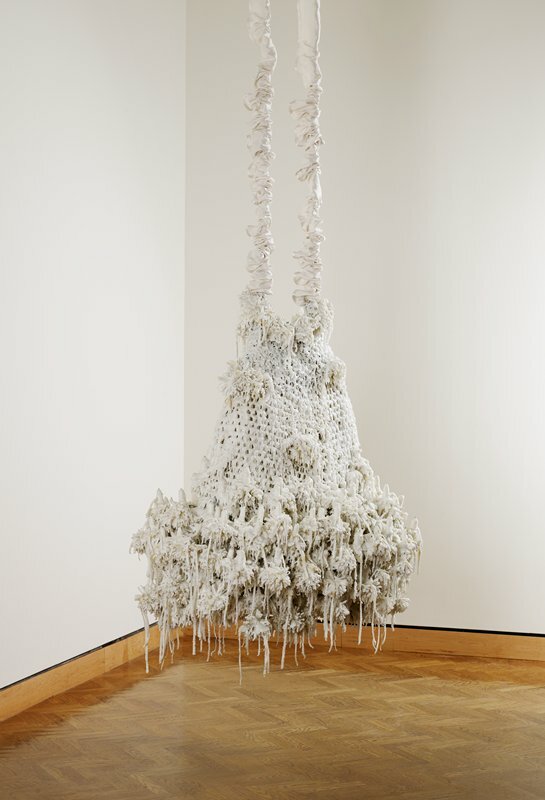 Untitled 752 is one of Petah Coyne’s beloved “girls,” a nickname the artist gives to all of her hanging sculptures. Like her sisters, Untitled 752 is an eerie combination of beauty and decay – underneath a thick layer of white wax lie remnants of found objects, their once delicate forms disfigured by the wax coating. The accrual of objects and surface in Coyne’s work can be viewed as symbolic of our own experiences. We all retain memories of relationships and incidents from our pasts, and while older memories may fade as we accumulate new ones, their presence always remains. Coyne emphasizes the potency of memory in her use of found objects, which she believes carry the residue of their former use.